Best Chicken tikka masala , is an easy curry recipe of succulent roasted chicken pieces dunked in rich creamy tomato gravy. This tomato base gravy is called as tikka masala gravy. This absolutely delicious authentic homemade smoky chicken tikka masala recipe is exactly like restaurant style dish. Here is how to make chicken tikka masala recipe at home. Today, up on the blog is, a popular chicken recipe not only in Indian but all around the world, especially UK. Yes, it’s best Indian Chicken Tikka Masala Recipe. Chicken Tikka Masala is also known as murgh tikka masala. It is rich dish of chunks of roasted/tandoori chicken cooked in creamy tomato base gravy and aromatic spices. The roasted chicken chunks are knowns as Tikka (bite sized pieces). 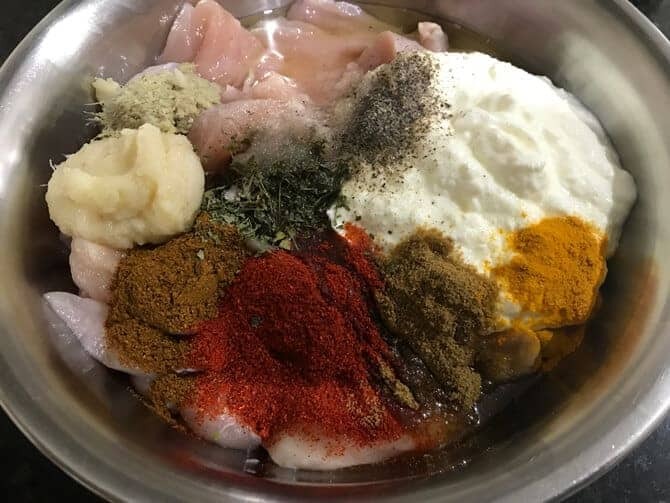 Firstly, the chicken chunks needs a marination into few spices, ginger garlic paste, yogurt and mainly cumin powder. Then, roast or grill the chicken pieces to get Tandoori chicken tikka. Now, these smoky flavour tikka pieces are combined with spiced tomato gravy( the tikka masala gravy). Here is best chicken tikka masala curry, a restaurant style recipe below. Do you all know that, chicken tikka masala recipe is a ‘True National Dish of Britain. It is said that, this tikka masala recipe was originated in Glassgow, Scotland. And, in India they say, the chicken tikka masala origin is Moti mahal, Delhi. History of this dish says that, chefs came out with this recipe when they wanted to use the left over roasted tikka, to avoid wastage. Some claim that it was inveted during the reign of Bahadur Shah Zafar. Truly speaking, whatever the history says, for us, the fact is, this super delicious chicken tikka gravy is always a hero. Now, let’s talk about how to make best Chicken tikka masala recipe at home. 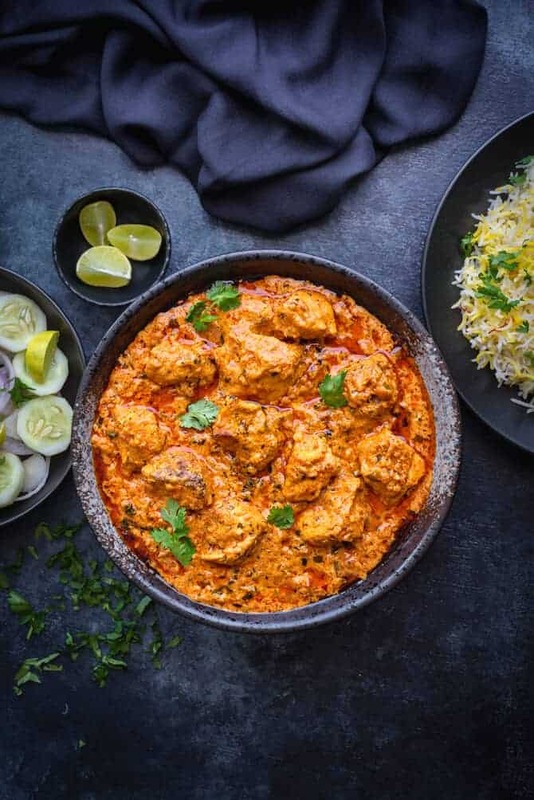 Apart from this Indian chicken tikka masala recipe, the other great dish or we should say chicken starter that we indians love to order in restaurant is tandoori chicken Tikka. The roasted tikka is put in tikka masala gravy. However, there is one small difference, when we want to relish roasted tikka as starters, Ajwain (carom seeds) and roasted besan (chickpea flour) is used in tikka marinade. Furthermore, most of the restaurants use mustard oil for marinade than refined oil for tandoori tikka recipe. But, when we are making chicken tikka curry, then we have to skip adding besan and ajwain to it. Because, it slightly changes the taste and flavour of the dish. But, still, there is no such rule to follow or skip it. You are a better judge to your taste and palate :). Proceeding further, then, skewer the marinated chicken and either tandoor it or cook it in an oven at 200 degrees centrigrade for 25-30 minutes. If you do not have the oven or tandoor, you can use use grill pan to cook it on stove top. 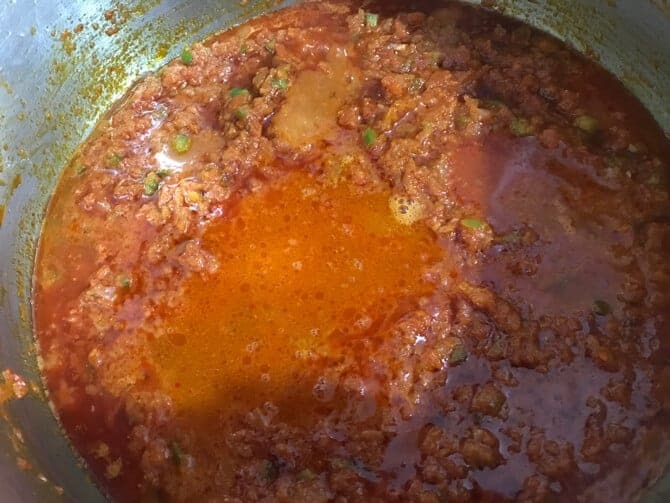 Now, to make tikka masala gravy, masala base is cooked in a mix of oil and butter along with wholes spices, onions, tomatoes, green pepper, spice powders and cream, finally add roasted tikka and give dhungar. Best Chicken tikka masala recipe in restaurant style is ready to serve. Now, comes the listing of chicken tikka masala ingredients. 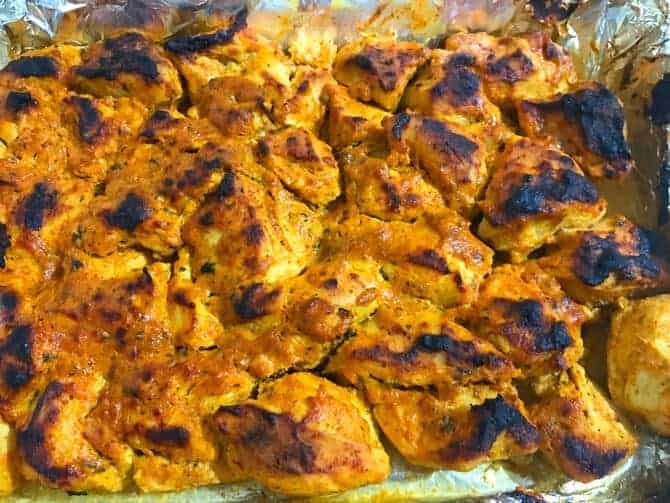 For tikka marinade, I have used nice thick yogurt (curd/dahi), ginger garlic paste, Red chilli powder, turmeric, roasted cumin powder salt and pepper powder. 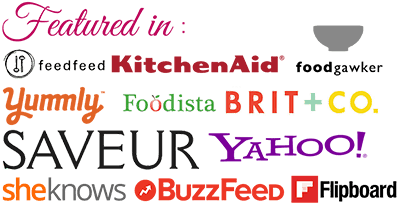 As you see in ingredients list below, I have mentioned about adding red food colour, if you wish. Having said that, I did not add any colour to the marinade. Do you know the best part of this recipe? 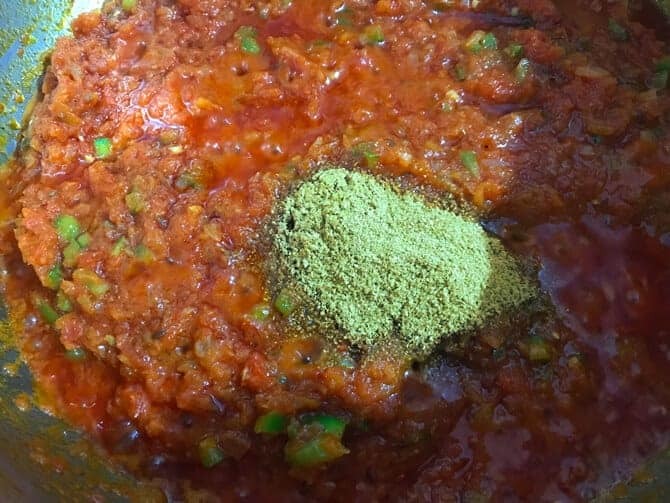 it do not require any store bought tikka masala spice mix or paste. 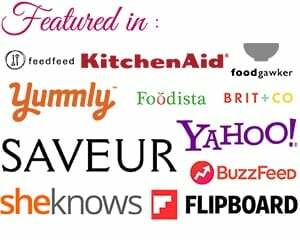 You can easily, make it at home with all the available ingredients in your pantry. But, soon I shall be sharing tikka spice mix recipe, in case if want to make it in bulk and store for handy usage. The other flavour enhancing ingredients are kasuri methi (dry fenugreek) and lemon juice. Another important point to remember is, the use of good quality garam masala powder. The good quality masala gives the lovely bold flavour to the tikka boti, else the flavour wont stand out. In that case, if masala is not good, the dish might need some more garam masala powder to enhance the flavour of dish. Thus, a good quality garam masala is preferable. 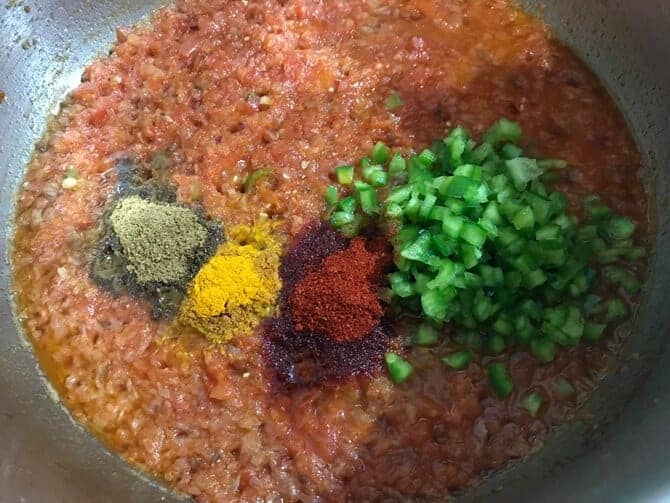 You can also use your homemade garam masala powder to make murgh tikka masala. To make chicken tikka masala gravy, we need to use onions, ginger garlic paste, and loads of tomatoes. Yes, tomatoes are the base of the dish. Tomato puree as well as the chopped tomatoes are the important part of this dish. The spice powders like red chilli powder, haldi powder (turmeric), coriander powder, roasted cumin powder, and salt are used, The other ingredients are few whole spices. i.e cinnamon sticks, elaichi (green cardamom), cloves and cumin seeds. A small secret is, an ingredient that makes the Indian chicken tikka masala recipe more flavourful is the addition of some finely chopped capsicum. Finally, the main component that adds spike to the dish is good amount of cream, honey and kasuri methi. 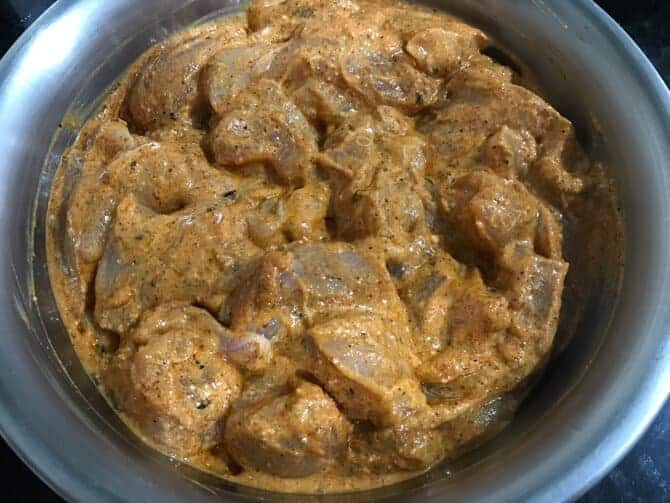 Unlike butter chicken or paneer butter masala, Chicken tikka butter masala is one such dish that requires little more cream. The addition of honey gives the balance to the dish because it makes a use of good amount of tomatoes in it. The tartness of the dish cuts off due to honey. 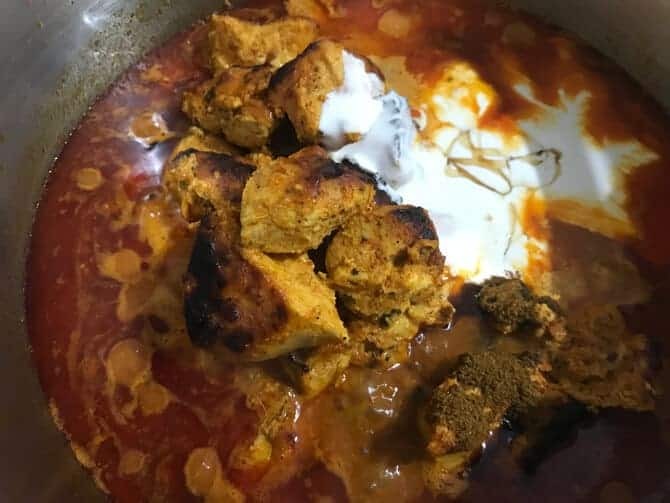 So, if you want to enjoy the authentic restaurant style Indian chicken tikka masala gravy at a home, do follow the recipe to the ‘T’. Also, the measures of spoon for spices and ingredients used in this recipe is standard spoon and cup measures. 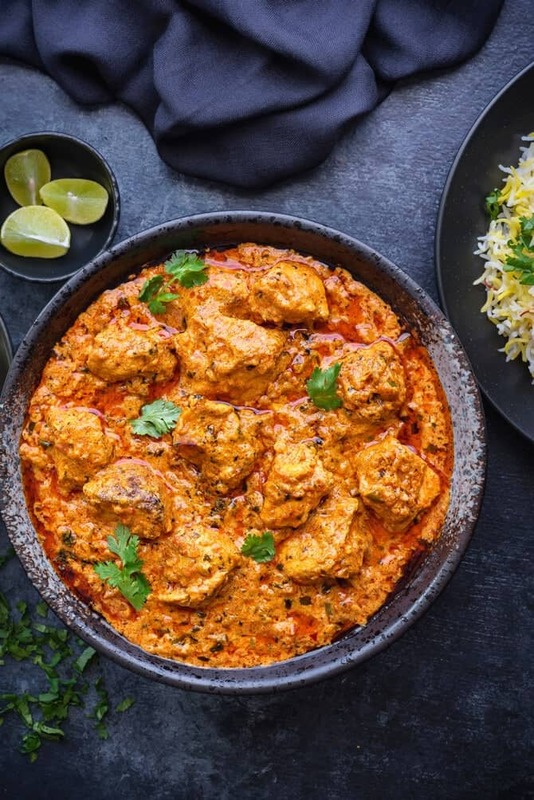 How to make Chicken Tikka Masala in a Slow Cooker? I know, you must be wondering, can we make slow cooker chicken tikka masala recipe? So, let me tell you that yes you can make it in slow cooker as well. 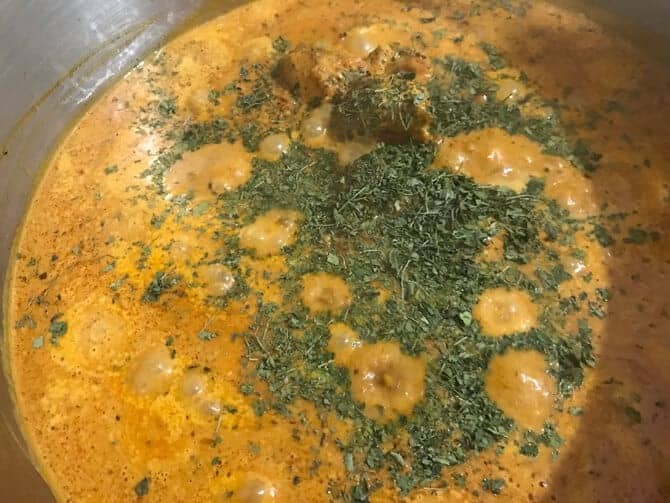 In this, all the ingredients for tikka masala gravy is added together, except cream and kasuri methi. Then allow it cook for on high for 4 hours. Usually, marinated chicken is added to the slow cooker along with the masala gravy ingredients. Then, cream honey and kasuri methi is added later. This will also give lovely creamy smooth tikka masala gravy. But I would recommend to add grilled chicken to it along with cream, honey and kasuri methi later to get that authentic tikka masala taste. And then again slow cook for another 15-20minutes. Lastly, go ahead with dhungar (smoking of chicken tikka masala gravy) which I have mentioned in the steps below. 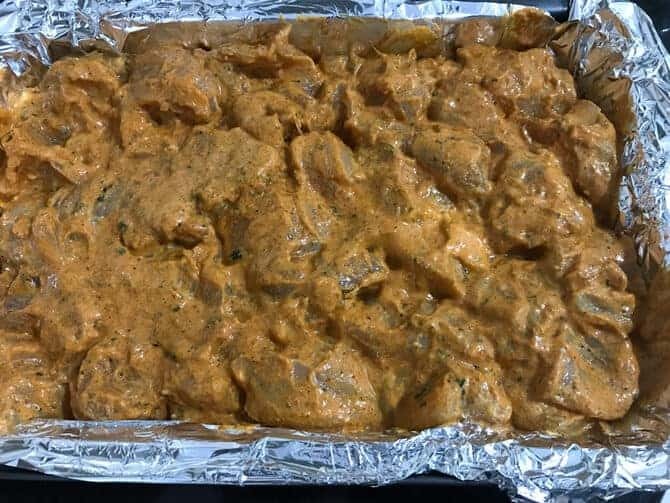 Can we freeze Chicken Tikka Masala? Best Chicken tikka Masala - this is an easy chicken recipe of a succulent roasted chicken pieces dunked in rich creamy tomato gravy. Indian Chicken tikka butter masala is a popular chicken gravy dish found across the world. Serve the dish with your favourite Indian flatbread or plain/flavoured rice along with onions rings on the sides. Here is how to make best chicken tikka masala in restaurant style at home. A pinch of red colour optional, I have not added any. In a bowl add chicken pieces and all the ingredients mentioned for tikka marinade. Once the marinade is done, cover and refrigerate it overnight. If in hurry marinate atleast for 2 hours. Broil the chicken for 20-25 mins or till its charred. You can also grill it in a tandoor or a grill pan. 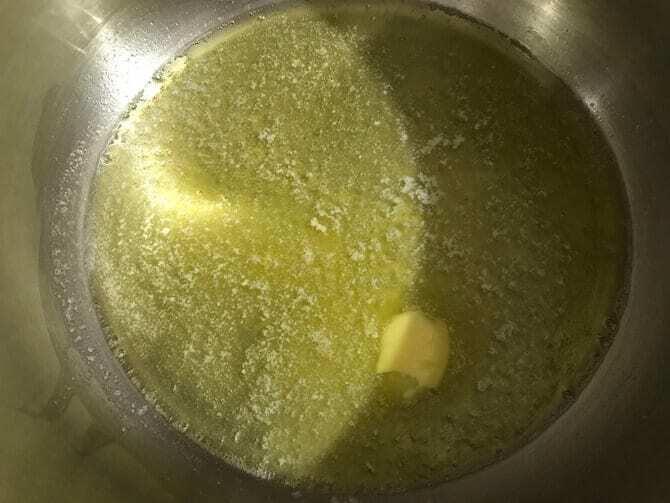 In a pan or kadhai, heat oil and butter together. 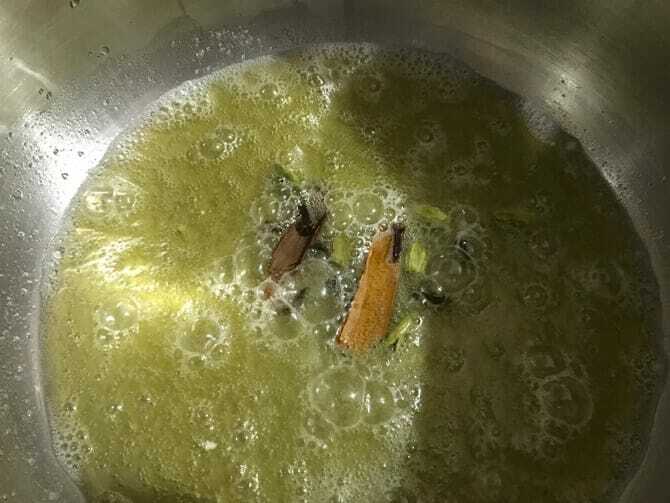 Add green cardamom, cinnamon stick and cloves. 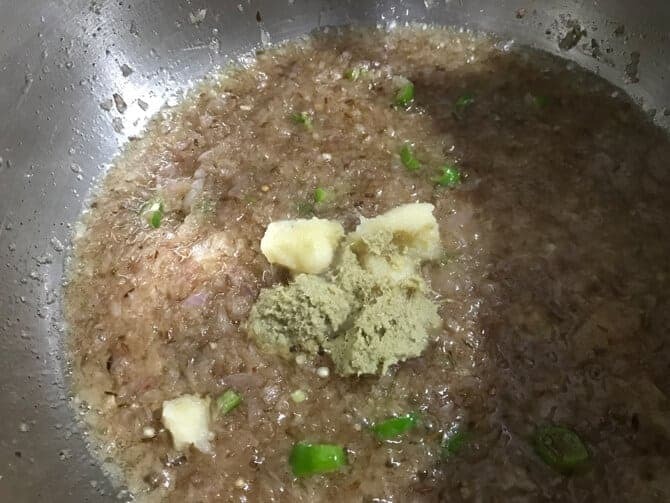 Fry it for 10 seconds, cover it, switch off the heat and leave it for half a minute so that the aroma of the spices gets infused in the oil and butter. You may discard the cloves, cardamom and cinnamon stick or leave them as it is. Turn on the heat. Add cumin seeds, salt and finely chopped onions. Fry until onions are translucent. Add green chilies and ginger garlic paste and mix. Cook for few seconds until raw smell goes off. 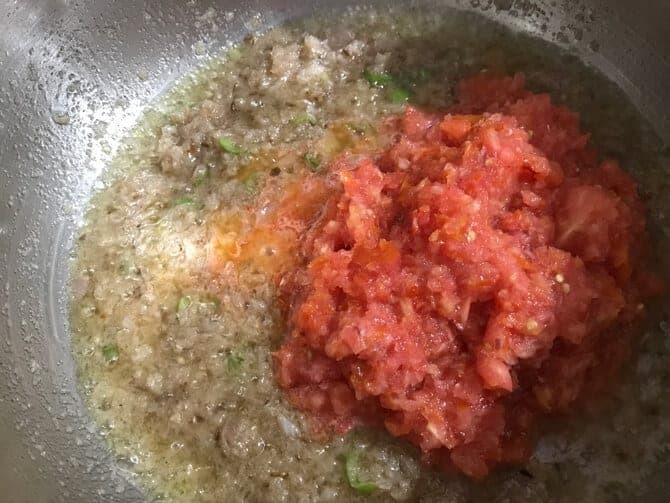 Now, add chopped tomatoes, cook till tomatoes gets soft and its water dries up. Next, add tomato puree and cumin powder. mix and cook for another minute. Now, add 3/4 cup of warm water and cook for 2 to 3 mins. Add chicken pieces, cream, honey, and garam masala powder. Cook for 3-4 minutes. Lastly, add kasuri methi and simmer for another minute. Heat a piece of charcoal on open flame on stove top. Once the gravy is done, place a small steel bowl or piece of aluminium foil on top of the gravy. Put the heated charcoal on the foil. 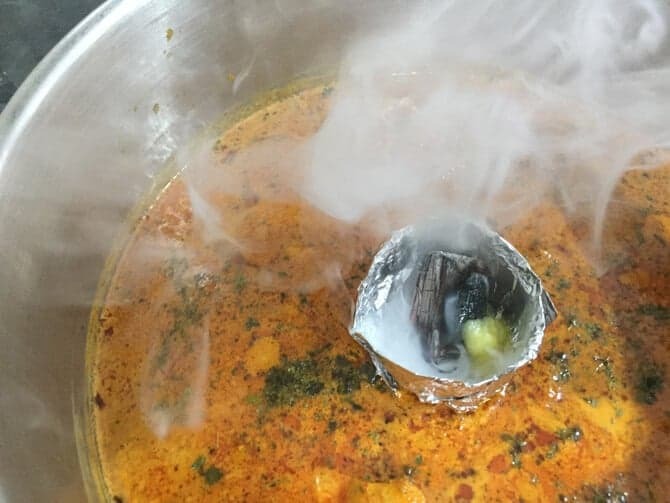 Pour 1 tsp of ghee over it to create smoke. Immediately, cover it with a tight lid to allow the smoke to penetrate in the gravy. Let it stand for 10 mins. You can add water to the gravy as per the required consistency. Spiciness of the dish can be adjusted as per the personal preference. In a bowl add chicken pieces and all the ingredients mentioned under marinade. 2. Once the marinade is done, cover and refrigerate it overnight. If in hurry marinate atleast for 2 hours. 4. Broil the chicken for 20-25 mins or till its charred. You can also grill it in a tandoor or a grill pan. To begin with, In a pan or kadhai, heat oil and butter together. 2. Then, add green cardamom, cinnamon stick and cloves. 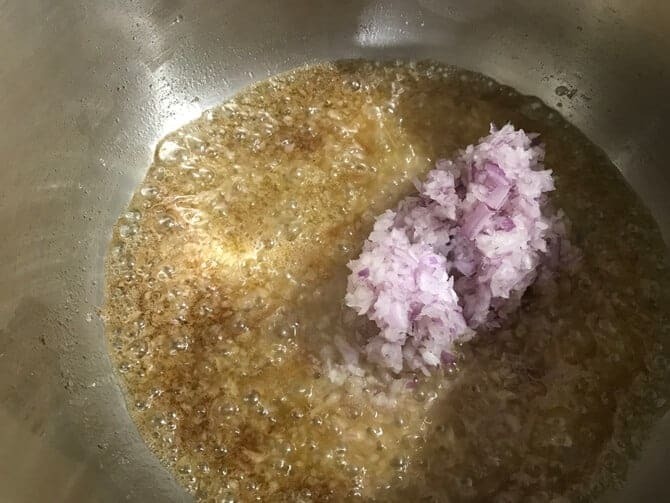 Fry it for 10 seconds, cover it, switch off the heat and leave it for half a minute so that the aroma of the spices infuses in the oil and butter. You may discard the cloves, cardamom and cinnamon stick or leave them as it is. 3. Turn on the heat and add cumin seeds, salt and finely chopped onions. Fry until onions are translucent. 4. Then, add green chilies and ginger garlic paste and mix. Cook for few seconds until raw smell goes off. 5. Now, add chopped tomatoes, cook till tomatoes gets soft and its water dries up. 7. Now, add tomato puree and cumin powder. mix and cook for another minute. 8. Then, add 3/4 cup of warm water and cook for 2 to 3 mins. 10. Lastly, add kasuri methi and simmer for another minute. 1. 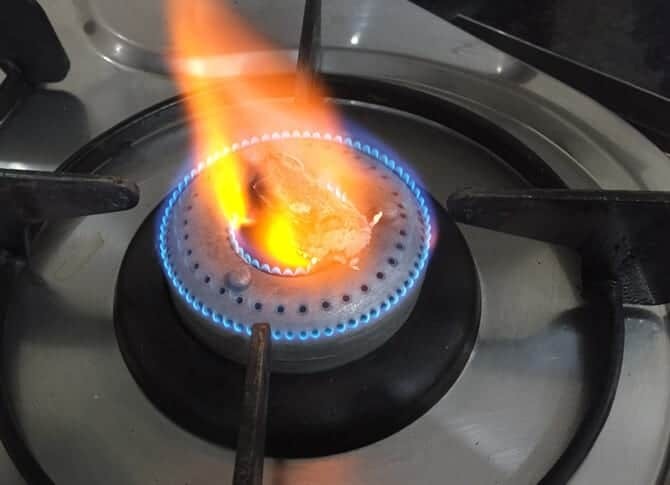 First, Heat a piece of charcoal on open flame on stove top. 2. 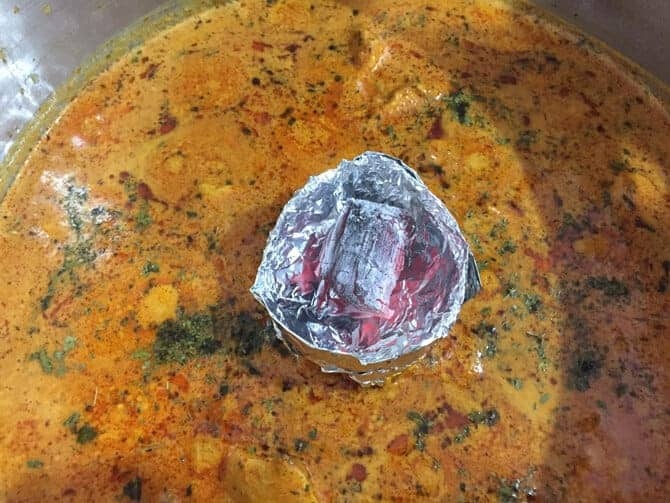 Once the tikka masala gravy is done, place a small steel bowl or piece of aluminium foil on top of the gravy. Put the heated charcoal on the foil. 3. Now, pour 1 tsp of ghee over it to create smoke. Then, immediately, cover it with a tight lid to allow the smoke to penetrate in the gravy. Let it stand for 10 mins. 4. Lastly, discard the charcoal. Dish out and garnish with coriander leaves. Indeed, Best chicken tikka masala in restaurant style is ready to serve. My first Indian meal I’ve made. It turned out fantastic!! It made a huge amount for my boyfriend and I. I made it with rice as suggested and it made two dinners and 2-3 lunches. Can’t wait to make it again!